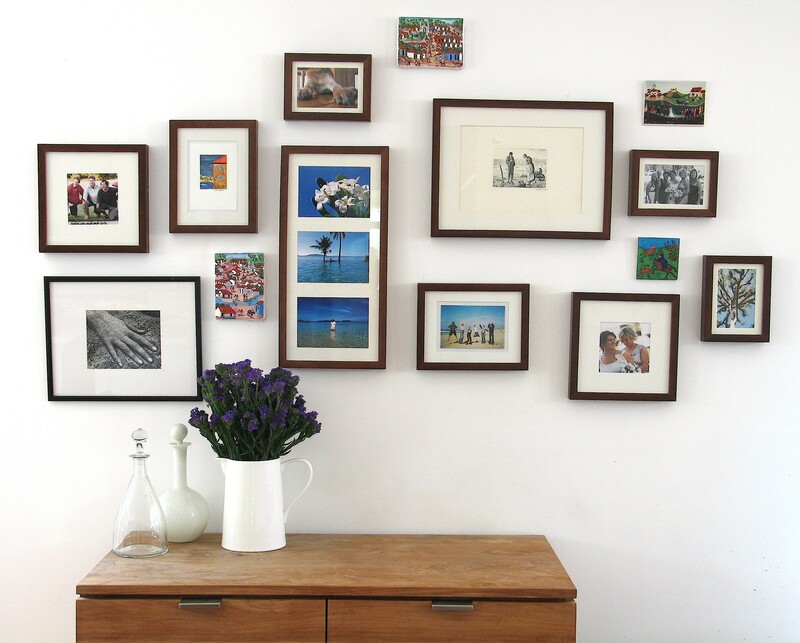 Everyone needs a wall of fond memories | Hey Bernice! Over the last 10 years I have collected artwork from trips to Nicaragua, France and London. Accompanied by images from holidays in Tasmania, Guatemala, Fiji, Broome, a road trip to New South Wales and our Wedding day. Naturally, Jack (our staffy X heeler dog) features in one way or another. I change it frequently, which makes it a focal point for visitors. 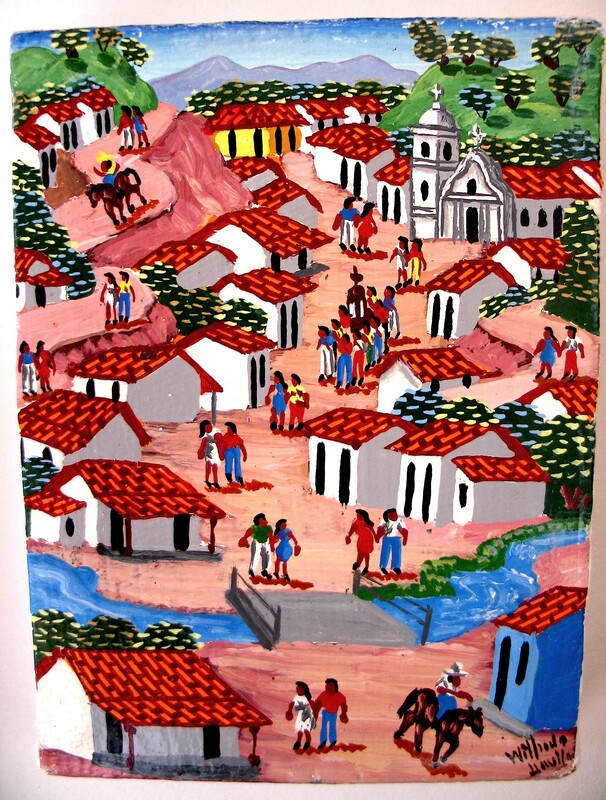 This tiny canvas was hand painted by villagers in Nicaragua, Central America in 2002. I picked these up at a local craft market in San Nicolás a municipality in the Estelí department of Nicaragua. If only I was back there now, I would have filled an extra suitcase with all the beautiful hand made wares. The budget and space deprived backpacker in me made the right decision to limit purchases at that time! My sentimental favourite is this Gérard Laplau post card tile (Villeroy and Boch). My Great Aunt (she is no longer with us) gave this to mum , and on the eve of my wedding day mum left it on my pillow with a beautiful letter (yes, there were tears!). She has also written our names and wedding date on the back of the tile. Wedding Procession is printed on the back in German (Hochzeitszug) and French (Le Cortege Nuptial ). I have actually found several items by Laplau for sale on ebay and other online sites if anyone is interested. 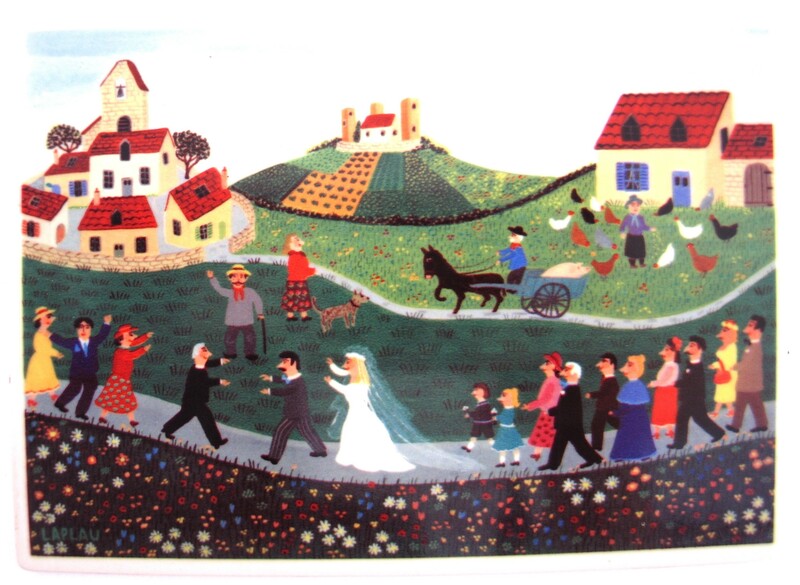 The artist Gérard Laplau is a French folk artist. His most famous work is the naif series from Villeroy & Boch. He died on July the 14th 2009 in Saint-Céré, France. Next on my list is my most recent addition. I picked this up at a Turkish Magic in Stratford in country Victoria. They specialise in handmade turkish persian rugs, ceramics, tiles, exotic gifts and Glass homewares. They also sell online. Scattered amongst the tiles and canvases are also photos of experiences I want to be reminded of daily – glorious tropical holidays, hilarious road trips, breathtaking natural landscape, and my husbands victorious fishing adventure! There are 3 other artworks amongst the frames. One is a print of a hand purchased from a market in London. Another, the black and white etching is the most mysterious of the collection. Marcel Jacque (1906 – 1981) is a French artist. Marcel Jacque is a well listed french artist from the Barbizon school of painters and artists. Barbizon is the real birth place of Plein Aire Impressionism. These gifted artist took the art of french impressionism and added their own use of light in the natural setting. Marcel Jacque studied under Rosseau for several years, his work is very rare and his hand signed works even more so. I guess you could call that a lucky find if it is in fact an original – I should really take it to be valued one of these days. The final item I bought in the south of France whilst camping/backpacking with my sister almost a decade ago. 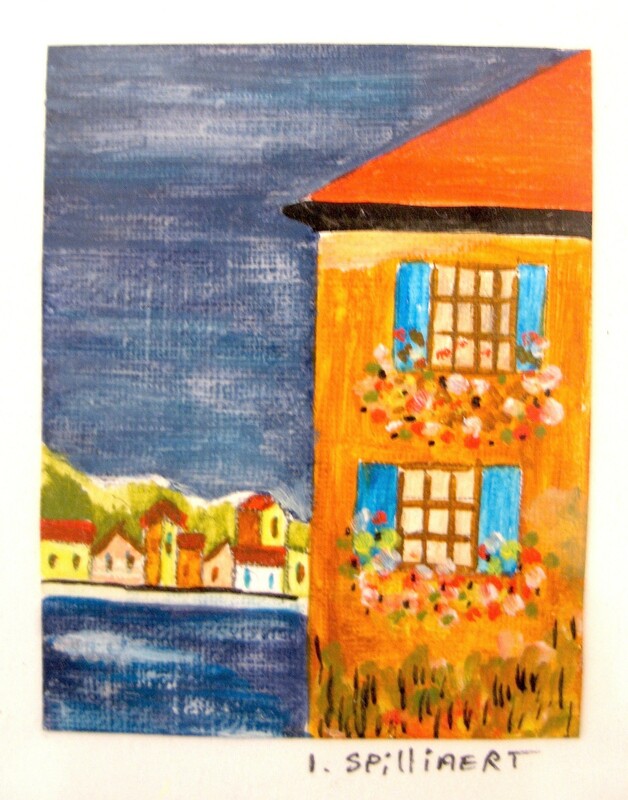 It is a hand painted gift card from an artist in Southern France. I have several of his cards, however only this one has made it to my wall. Whilst I have been collecting my memories for many years – it is never too late to start. And keep changing them, it keeps your wall interesting… even for you! A quick hint – Ikea is great for frames. Brown, black, white, metal/silver finish – whatever tickles your fancy. I’ll be sure to let you know if I have made thousands on my Marcel Jacques etching, when I get around to arranging a valuation! Grand to see the name Marcel Jacque(s) and your mysterious story to go with it. When I was sixteen, in France for a tour, I went to Rousseau’s home in Barbizon and walked through the forest there. The studio was open, and an elderly man was at work sorting some etchings. I was fascinated to watch, and though my french was very poor, he treated me as if I belonged there, watching him work. He had etchings for sale, but beyond my student budget. I kept eyeing one that appealed to me. As I left the studio, this lovely man took down the etching and inscribed it to me as as ‘souvenir de votre visite’, and signed it Marcel Jacques. Apparently he was Rousseau’s grandson, though I have not yet checked that fact. I thought you might like to know a little of the artist from a first hand experience! Julia, what a beautiful story… it is so fitting for the way I felt about the etching when I first saw it. Thanks for sharing that with me. I wonder if your etching is the same as mine? 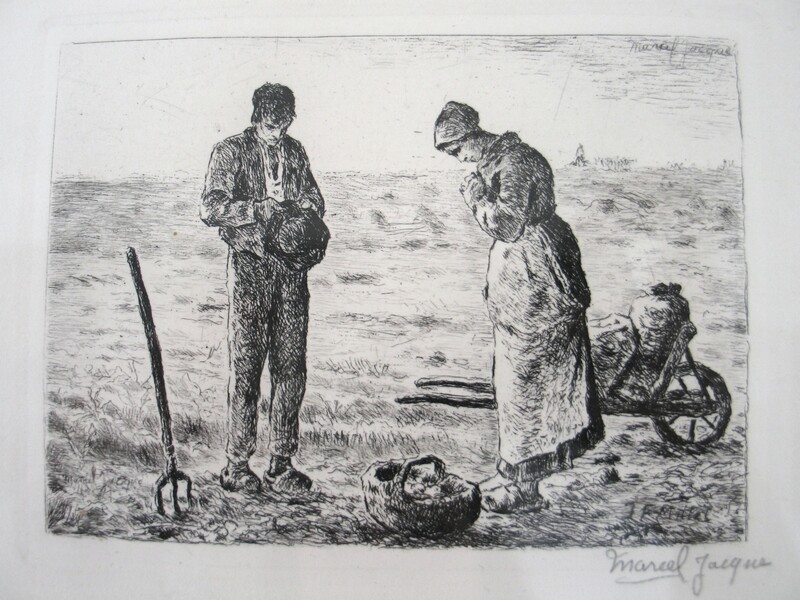 I too have an original etching by Marcel Jacque! Unlike you two ladies, I have never been to Barbizon, just acquired the picture from a friend who has since died. I would like to sell it. Any ideas how to go about this? The best approach is to take it to a fine art auction room, their experts will value it for you, then you can decide what to do. Joels or sotherbys are the well known ones in Australia. Good luck! Inscribed as is yours but dated 16 Oct. 1965. Mine was also left to me from a friend who died. And I would also like to sell. Did you find out the value? I did take it into an auction room, where they looked up similar sales history. They indicated that the last one sold wasn’t for a large sum, and there wasn’t a great demand. Who knows, if we wait long enough….. I have just looked it up – you are right, it is very similar! The same emotion is felt from the two subjects in it. heybernice: I have 2 original color paintings by Marcel Jacque. One is 7×9 of a young shepard girl walking down a country lane carrying a small lamb followed by a flock of sheep. The other 9×7 is of a country cottage. Both are signed in pencil Barbizon 17 june 1952 and also signed in pencil by the artist. The cottage one also is signed within the painting itself in addition to the pencil signature. I have been unable to find out much about the artist or these two works. I am not to good with technology but will try to send you photos by e-mail. Your comments would be greatly appreciated. Carl. I have a small picture as well. Signed and in pencil it says ‘a un passage a Barbizon le 18 aout 1958’ It looks like pen and ink with water colour. Cost me 30p at a boot sale. It has always fascinated me and have never yet been to Barbizon. I love hearing stories like that – what a find!